Any crunchy holistic health nut worth their weight in coconut oil will know that mainstream commercial makeup products often contain toxic ingredients. Many of us have traded in our regular mascara, lipstick and bronzer for alternative products that are less toxic for our skin, organs and hormones. However, there is another insidious threat that resides in our makeup containers, whether they are organic or not. Compacts, tubes, brushes and wands make the perfect breeding ground for many types of bacteria, including staphylococcus, streptococcus, micrococcus and E. coli. These critters are especially likely to thrive in older makeup, where antibacterial agents start to break down six months after purchase. Now before you see this as a sensational fear-mongering story, let us point out that many of these bacteria are commonly found on and in the human body. However, the concern is that there is a risk of them growing or mutating and becoming dangerous. In an experiment conducted by ABC News, 25 samples of dated makeup products were sent to a lab for testing. Eleven of those items came back testing positive for various bacterial strains that could cause pinkeye, rashes or strep throat. The FDA reports that there have been rare cases where users have become temporarily or permanently blinded by infections from cosmetics. This can be a particular concern in the case of a makeup brush or eyeliner causing a scratch on the eye or surrounding membranes. For some people, these bacteria might be completely harmless, but it depends on the strength of an individual’s immune system. A person’s resistance may vary day to day as well — a strain that is usually harmless may cause illness when the person is run-down and has impaired immunity. The bacteria can also multiply and adapt very rapidly in order to survive in adverse conditions. This may enable normally innocuous bacteria to cause a sickness after a strategic mutation. The risk of infection increases with each use of a product, since contact with the body and the outside world adds in additional strains of bacteria. Outside of acute conditions such as eye or throat infections, bacteria in makeup can also fly under the radar and incite skin problems that might be attributed to other causes. Dermatologist Jeanine Downie explains that mild breakouts or even more severe acne problems and infections could be caused by bacteria from contaminated makeup. If you’ve put effort into sourcing organic, cruelty-free, naturally-based makeup, you will want to be aware of ways to keep it bacteria-free and lasting as long as possible. Be sure to sharpen eyeliner or lip pencils a little bit before each use. This will remove the outer layer where bacteria have been dwelling since you last used it. You can also use rubbing alcohol or vinegar to clean your sharpener and remove any debris that can harbor bacteria. Don’t hold on to any products that no longer have a lid. Unfortunately, if you’ve lost the lid, the most prudent choice is to dispose of that product. The same goes for any product where the ingredients have settled or separated (such as old liquid foundation). This likely indicates that the antibacterial phase of the product has ended. Unfortunately, if you’ve lost the lid, the most prudent choice is to dispose of that product. The same goes for any product where the ingredients have settled or separated (such as old liquid foundation). This likely indicates that the antibacterial phase of the product has ended. Remember to keep the bag or drawer where you store your makeup clean too, by vacuuming it out and then wiping it down with some diluted tea tree oil or vinegar. Another important point is that makeup products and brushes should never be shared. Different people have different strains of bacteria living on their bodies, and cross-contamination may introduce an unfamiliar strain that your particular immune system is not able to fight off. The main risk with sharing items is passing on an infection such as viral conjunctivitis or pinkeye. One woman, however, had the extreme misfortune of contracting a drug-resistant MRSA infection from sharing a makeup brush with a friend. Note: Reports explain that about two percent of people naturally carry an antibiotic-resistant version of staphylococcus on their skin. This particular woman was exposed via a pimple on her face, after which the bacteria infected her spine, causing paralysis. As you can see, it’s very important to avoid cross-contamination of bacteria through the sharing of makeup, applicators and brushes. It is also wise to keep your own brushes clean (see the section below). Perhaps you are trying to avoiding using makeup too often and have investigated the possibility of more permanent solutions, such as eyelash dyes. More often than not these will present more of a toxic danger; the better alternative is to use good quality makeup but replace it on a regular basis. The European Union even introduced regulations in 2005 where cosmetics manufacturers must label products with the date that they will expire. In the U.S., the average makeup bag contains products that are four years out of date. 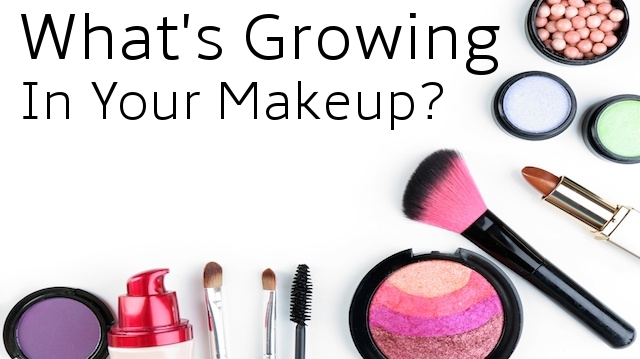 One survey found that 68 percent of women will keep makeup products until they run out, regardless of how old they are. We at the Alternative Daily like to condone a non-toxic DIY approach. If you make your own makeup products, you will be cutting out many toxins, which will likely result in clearer skin and less requirement for makeup. You will also be able to make smaller batches with cleaner ingredients, incorporating naturally antibacterial oils, such as lavender and coconut oil. These homemade products will last longer and provide immune support for the body when you use them. You can also use up smaller batches faster, rather than leaving them sitting around for many years. Dirty brushes are a significant problem, as indicated above in the case of the woman who contracted MRSA bacteria from an infected brush. Other illnesses that can breed on brushes include herpes, ringworm, and impetigo, an infectious disease that causes blistering of the skin. Good quality makeup brushes can be expensive, so it’s a good idea to invest some time and effort in keeping them clean and sanitized. 1. The first thing you’re going to work with is the olive oil. Pour a tiny bit onto your washcloth (or paper towel) — no more than half a teaspoon should do it. Dab your dirty makeup brush in olive oil and swipe it on the towel. This pre-cleans the brush and conditions the bristles. You will see lots of makeup residue start coming out of the brush, because makeup is oil soluble and the olive oil will be dissolving it. 2. Mix together warm water and Castile soap in a small bowl, and wash your makeup brush in it. Just pour about a teaspoon of liquid Castile soap into a small bowl and add a bit of warm water. Scrub the bristles with your fingers in the soapy mixture. Squeeze out the bristles and do this a few times. Once the water seems to be coming out of the brush clean, move on to the next step. 3. This next step will cleanse all of the excess olive oil out of the brush and leave an antibacterial finish. Dip your makeup brush in vinegar, then rinse well with hot water. Repeat this process a few times until the water comes out clean. 4. Squeeze the brush with a towel and reshape it, then let it air dry. Now that you have the necessary knowledge, go and make sure you renew your makeup collection. The chance of infection is rare, but definitely not worth the risk. Remember that makeup is an organic compound, just like food. You wouldn’t eat moldy food, so don’t use nasty old makeup or dirty brushes. 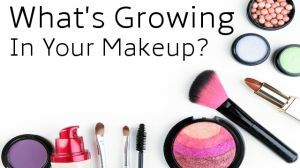 Hey Buddy!, I found this information for you: "Are There Dangerous Bacteria Growing in Your Makeup? Tips and Tricks to Stay Safe". Here is the website link: https://www.thealternativedaily.com/dangerous-bacteria-makeup-growing/. Thank you.